Games are fun in many different ways, but it's not often that I go out of my way to say that a certain game is beautiful. And no matter how you look at it, Dixit is definitely a beautiful game. Beyond its visual appeal (which is a mix of fantastically fascinating to oddly disturbing), Dixit is also a wonderfully easy game to learn and a great way to introduce new players to more European style gaming. And yes, this is indeed a game that is good for the whole family - but it's designed in a manner that makes it still fun to play regardless of your age. If anything, the "flavor" of each game experience will depend on the players involved, given that's what will define the context of your clues and other discussions. But I'm getting a little ahead of myself. Given a starting hand of random picture cards, players take turn as the "storyteller", who will give the clue or theme that everyone will need to follow. 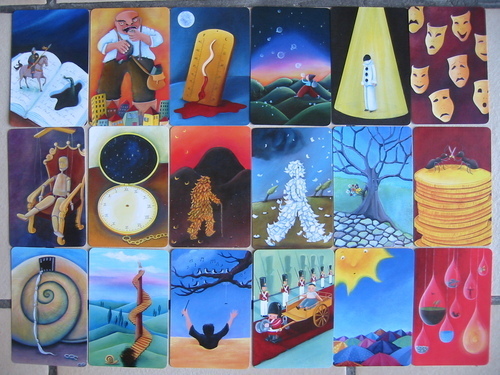 The storyteller then declares the theme based on his cards and sets his card that best fits the theme face-down. Now all other players will select cards from their own hands that best fit the theme. Once all cards are in, the storyteller shuffles them together and lays them out in random order. Players (except for the Storyteller) then select which card of the set bet fits the declared theme and votes in secret. Once votes are revealed, then the scoring begins. The goal is to figure out which of the cards was played by the storyteller, which can get tricky given everyone else has presented potentially feasible cards that also connect to the theme. If none of the players guess the storyteller's card (clue was too vague) or everyone guesses the card (clue was too obvious), the everyone score 2 points except for the storyteller. If at least one person guesses the right card, the storyteller and those who voted for his card score 3 points. And finally everyone whose card was voted by mistake also get to score 1 point for each vote in his favor. First, the cards are amazingly beautiful. I mean just look at them - they're the kind of cards that make you want to think of stories or at the very least wonder if this isn't some sort of personality test. They feature some very strange images and some wistful ones and overall they're just gorgeous. And every single expansion of the game pretty much just gives you even more cards to play with. But the cards are just a series of visual pegs - story starters that the storyteller and eventually the players will use as inspiration to find the right card and clue that will score the most points. And this is where your knowledge of the other players can really come into play - as a storyteller you only need one person to guess your card right. Everyone else can wander around at will. And thus if there's a reference only the two of you can get, then this may be a viable strategy. However as you increase the number of players, you'll realize that one can actually score more points when you're not the storyteller by stealing votes. A well-played card means snagging more points in your direction and if you're lucky you'll deny the storyteller as well. And so when you play this game between friends and family, you'll find that your "strategy" may shift based on who's at the table. And despite the random nature of the cards that you'll draw, stealing points isn't necessarily that difficult. A popular clue that comes up in our games is "Pixar", and the nature of the images can connect to quite a number of Pixar animated movies. We've even had games with people as themes such as a birthday game with all the clues related to different aspects of and stories about the birthday celebrant. If you have the original version of the game, then you also get to enjoy the somewhat idyllic notion of these little wooden rabbit tokens traveling around this part of the forest - which is what the board is meant to look like. The current version of the game provides a simpler board, more spaces to store cards and a rather large visual reminder of how the scoring rules work. 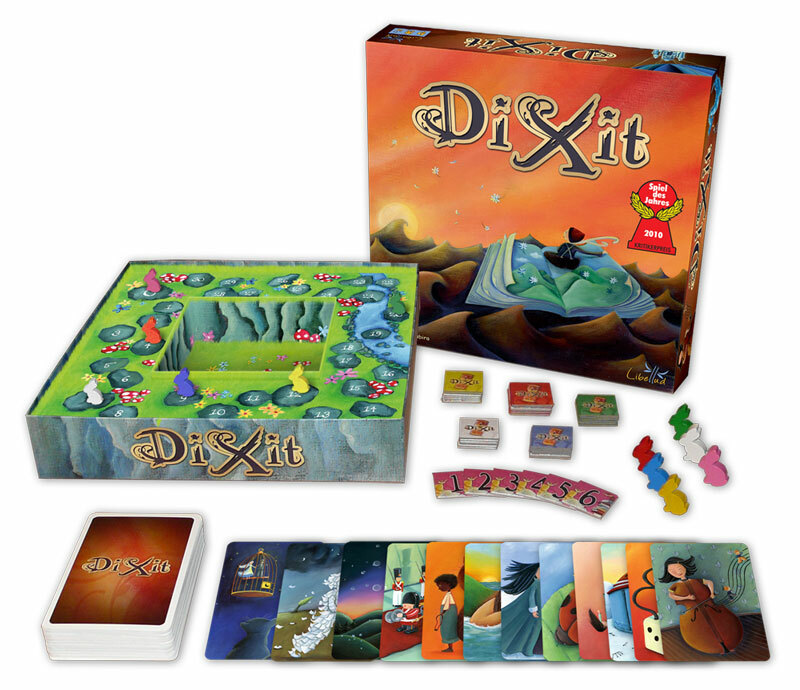 Dixit is a game that is elegant in its simplicity and quite the wonderful experience to share. We've used this game to get quite a number of people excited to join one of our game nights, especially for newer players. Thus the game gets a well-deserved 5 happy rabbits racing to 30 points out of a possible 5. The game does become more interesting when you try it out with different groups. The results can be pretty surprising.